This Piggly Wiggly was in the High Point Centre shopping center at the north-east corner of Lake Murray Boulevard and Columbiana Drive. As far as I can tell, it closed in 2009, and seems to have pretty well put-paid to the whole plaza in so doing. I rarely get over to Lake Murray Boulevard (as you can see here, I still haven't managed to make it to this Pig in the daytime..) so I don't know the market too well, but this closing seems a bit odd to me. This is one of the newer, larger, Pigs, so it's not one of the tiny old stores that they are trying to transition out of, and there's certainly no lack of traffic in the Harbison area. In fact, this store sounds as though it were a flagship of sorts, at least this story from 2005 paints it as the store chosen to do the public launch for PW's new "Pay By Touch" system. This LoopNet listing has a daytime picture of the store with Pig branding (and confirms that it was built in 1994, which still seems pretty recent to me). UPDATE 9 March 2011: Update closing date to 2 Feb 2008 based on comments. Subscribe to comments with RSS or TrackBack to 'Piggly Wiggly #60, 800 Lake Murray Boulevard: 2 February 2008'. I go by this place everyday I go to work. I spoke to someone who worked there at the time of the closing as to why they were shutting down. he told me that it came down to two things: 1. the stoe was making money, but not as much as corporate wanted it to and 2. corporate was scarred about the impact the new Wal-Mart (about 5 miles down the road) would have on the store. I shopped there often and found it to be one of the nicest PW's I had ever been in. Unfortunately the company that was doing the "pay by touch" for PW went out of business (in 2009? 10?). Rumor had it that it would be an Earth Fare/Fresh Market. That would be splendid. St. Andrews had a Fresh Market back in the day, but could not support it. Now I don't think it would be a problem. Never been a PW fan, but really nothing against this store in particular. It was a bit tough to make a left out of at either exit, but there really is no way around it. A "healthier" grocery store would do well, with all that Gold's traffic. Could be -- it was still listed in the Bellsouth phonebook that was issued in in Feb 2008 (or to be discarded in Feb 2009 at any rate), but there must be a pretty good lead-time on those listings. @Jonathan-I one time or another I had heard that a fred's or Big Lots would go in as well. The current rumor is that Earth fare will open on Harbison in the new center being built across from the Bank of America branch. Thanks, Tom. Well, now that Big Lots is in St. Andrews hopefully that shouldn't happen. When you say "across" from BOA, are you talking about next to Chick Fil A? Where those doctor's offices are? I did not know those were being demolished. Wow, that'd just be torture to get in/out. If they must clog up the area anymore, it would be good to have it where Goody's was. Still, I try to avoid grocery shopping on Harbison. The Publix is not as nice as their Kennerly/North Lake locations. @Jonanthan, there was an article in The State about a month ago that indicated that they were going to tear down the former doctor's offices and build a retail complex of some sort. McDonald's will move a block down from their current location at Saturn Parkway and Harbison Blvd. as well. I don't know any further details except for the Reality Link listing. Click the "Site Plan(s)" link on the page and you'll see what the development is going to look like in a pdf format. This is the area between Chick-Fil-A and Park Terrace Drive. Thanks, Andrew. I don't understand why they continue to build when is such an abundance of empty property/storefronts available. I am not a big Chick Fil A fan (although happy with the spicy sandwich), although that is not here or there. I would not attempt to go in that Harbison store just due to the configuration of the entrance exit, and they alone cause much of the problems at that intersection. And now I find out it's gonna get worse!?!? I'm with you two. Walmart, the city of Cola, and Richland and Lex counties should be sued for the mess they have created. The intersection behind the McDs, the only way to exit Best Buy, is an eyesore and an abomination, and Park Terrace is just as bad. It has appeared since that Walmart was built that exit at Saturn Pkwy/ Jamil Temple Rd(?) Best Buy was a work in progress and it could be so easily fixed. The road runs right along beside the lot! It seems the powers that be intend for everyone to exit out the back by Sam's to Bower. I will stop now, lest I gain a reputation as a grumpy gramps. I really am a happy person, really! Best Buy isn't situated in the most ideal manner. Navigating that exit can be tricky at times. If whoever is in charged is smart, that intersection would be reworked but unfortunately it makes too much sense for these people and I don't know what it'd take to get it done but it does, regrettably, make too much sense. The Best Buy near Columbia Mall performs better from what I hear and I think the way the Harbison one is situated makes for a tricky maneuvering which is an easy turnoff. Thanks for the update, Andrew, I'm not in the area too often anymore. Looks like the powers to be don't really care about traffic flow, do they? Also, looks like we have managed to move this thread all the way down Columbiana Dr and taken a left. This started at the old Piggly Wiggly. Here's a story from The State on upcoming Harbison road work.. Some Irmo-area residents were asking this week why their local Piggly Wiggly store at 800 Lake Murray Boulevard was suddenly closing for good on Saturday after 13 years. "I thought it was doing enough business to stay in business," said resident Kathy Stevenson, who has shopped the store for seven years. Well, things might not have been as peachy as it appeared, the company said. Hmm, probably Saturaday 2 Feb 2008 then.. I wouldn't want to have my grocery store anywhere w/in 10 miles of a WalMart. For a long time the state of Vermont would not allow a WalMart to come in b/c it threatened the existence of other businesses. I don't know whether or not Vermont has one today. WalMart should be limited to how many stores it, or any retailer, can open in any given area, right??? I worked for Piggly Wiggly for four years and I remember when this Pig closed, simply because our store (S.Lake in Lex) obtained a few employees from this store. Simply put, Piggly Wiggly is a dying grocery chain. The pay by touch never really worked, so that died out quickly. Piggly Wiggly is running out of money, and I'll be shocked if they're still around in 20 years. It didn't make much sense for this Pig to have closed down...but in the last year, a handful of Pig stores have closed their doors. The "recession" has not been good to the Pig. Thats for sure. And I'm not 100% biased on this because I worked for the company for four years; but why buy expensive groceries when you can get the same groceries from wal-mart for cheaper prices? Piggly Wiggly is all about customer service, which is very commendable. But these days, people just want to save money; customer service doesn't matter when it comes down to dollars and cents. The Pig is closing a lot of stores and is leaving a lot of their employees without a job. They don't take care of their seasoned employees (on that, yes, I am biased), and it's starting to bite this company back. @Terry I can def. understand why you'd see Piggly Wiggly as a dying grocery chain. They don't have the locations around here they used to. There are quite a few other Pig closings mentioned elsewhere on this site and perhaps a few others that aren't on here for various reasons. They were scared about how the new Ballentine Walmart would impact their business and that was the big reason why they left despite it being profitable. They bought Harris Teeter's 4 Columbia locations in 2001 and wound up closing two of them 3 years later. Harris Teeter had been scaling back their market presence but there's a side of me yearning for the day that they're back in Columbia. Maybe if Piggly Wiggly dies, Harris Teeter can see an opportunity to reenter the Columbia market once again...or maybe Winn Dixie could stage a comeback with their newly madeover stores (of which I've seen several on YouTube). I am not the world's biggest fan of Walmart but I do like the look they are deploying in their stores as of late. there's a significant portion of corporate America that doesn't take care of their frontline employees and I hope to see the day that it catches up to these companies because I think those types of things have a way of catching up to folks in due time. The same instance about a year or so after this Pig's closing happened at the one I worked at in Lexington. A new Wal-Mart opened up in 08 and we took a hit in sales at first, but slowly regained customers. The company is definitely doing better in the Charleston/low country region where the corporate offices are. And, of course, Publix isn't helping matters up here either! As a former employee I can surely agree with these things "catching up" to the company, as I've witnessed firsthand the company reaping what they've sown (and not reaping rewards either). I would welcome Winn Dixie back with open arms. Because of my falling out with the Pig, it's hard to say that I have fond memories of grocery stores. But I do have fond memories of my mother taking me to Winn Dixie. They always seemed to have free samples, and a GREAT magazine aisle. When they died out around here, that certain building was empty until about two years ago when Food Lion began their remodeling craze, purchased the building and opened a Food Lion. The Piggly Wiggly on Platt Springs Road became some sort of smoke detector plant for a while, but I have no idea what it is now (if it is even open). Piggly Wiggly will eventually go the same way the Colonial Stores did..it will die off. 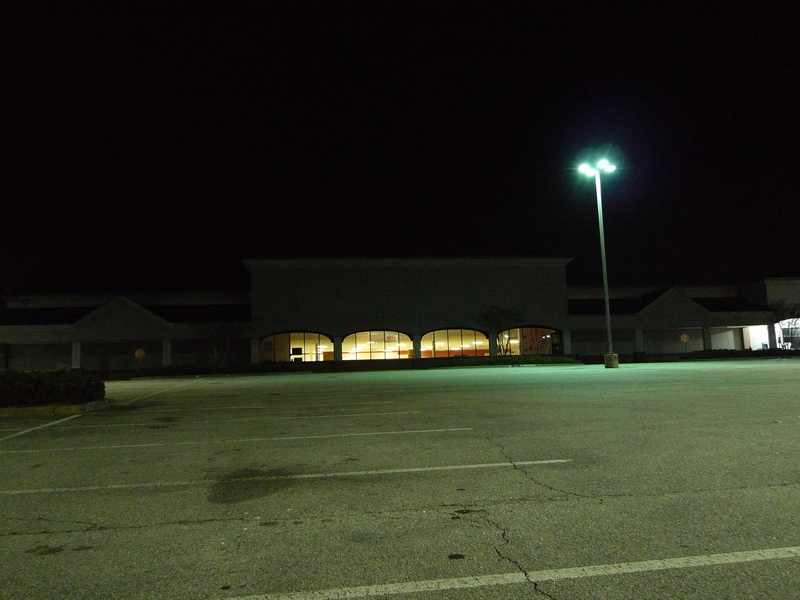 Winn Dixie was good, but Walmart came along and killed off a lot of places. A lot of these older places are still around, but just not here in SC and Columbia. 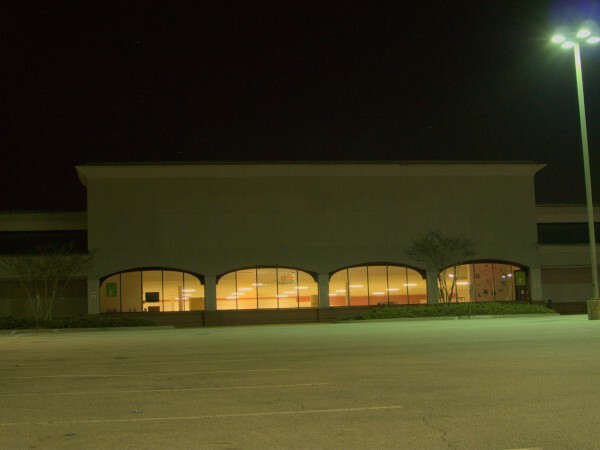 This one has already been discussed on Have Your Say but I just checked the NAI Avant listing on this particular shopping center and it doesn't show anything conclusive but I have seen folks working on the inside of the building but no idea what it's heading towards just yet. Simply put, it's on my list of places to keep an eye on in the new year. Word on the street is that this might become Hamrick's new location, they want to move out of Outlet Point. Well, you could hardly blame them! hmmm...I had heard that they were interested, I got in touch with the Director of Operations for Hamrick's and she was unable able to confirm a new location yet in Irmo. I have an aunt that enjoys shopping at Hamrick's but if they moved out to Irmo, it'd be way off her radar...a part of me hopes that if they were to move, they'd move into the former Kmart. That being said, I'm far from being their biggest fans but they were committed to staying at Outlet Pointe when everything else in that outlet mall closed. They walled in Hamrick's and the remainder of what used to an Outlet Pointe Mall is now office Suites. It once had Wacammaw Pottery then it had Silk Flowers and Things for a while. I also believe it had Plej's but all those stores have died off completely. I also recall an antiques shop as well and a Subway being in that mall. Andrew, I am hopefully guessing your Aunt is in her 80s. That will be horriffic if they move in there. That is about the farthest thing from an Earth Fare grocery store that I can imagine. Hamricks should permanently move into the old Wal Mart building on Harbison Blvd. Think about it. Hamricks, SAS Shoes, A.C. Moore Crafts, Family Christian Bookstore, and finally Total Wine (for ingredients to make rumballs). It is one-stop senior shopping. I know that sounds funny, but I'm really not joking. The AC Moore you are talking about Jonathan is closing that location due to unagreeable lease renewal terms. It should be on here soon enough. I recall visiting this Piggly Wiggly in 2006. It was a busy store. One negative the store had was lacking a pharmacy department. Very few remaining Piggly Wiggly stores have them. Piggly Wiggly was a great store is you were looking for good old fashioned down home ingredients that you couldn't find in other stores. They also carried lots of local produce, which other stores didn't do a lot of at the time. Sure they didn't carry all of the organic and vegetarian/vegan stuff you see everywhere today, but that just the way the Pig was (and probably why it won't be around much longer). I'm not sure if it is still the same, but the Friarsgate Bi-lo and the one at St. Andrews and Piney Grove used to carry different items. Since there are still a lot of older, rural residents in the Dutch Fork/Ballentine area, they carried things that would cater more to that type of customer. The biggest problem, today, with this location is getting in and out. I went to New China a week or so ago and caught hell trying to make a left onto Columbiana Dr. to get back to Lake Murray Blvd.!!!!! I do not believe it would be allowed to place an intersection any closer to the I-26 intersection. I would bet the existing intersection is as close to I-26 as would be allowed on Lake Murray Blvd. Next door to this is a former SunCom store. Prior to it being Suncom, it was a Revco. Sean, I see the similarities you do, but continue to ponder Terry's post earlier in the comments here indicating that Piggly Wiggly is a dying grocery chain and your indication of the forthcoming closure in Summerville doesn't do anything to refute that idea. Kroger isn't as strong in the Columbia market as they once were but they do have 3 stores...and perhaps they might build another one or two here as it's my understanding that they are looking to build another store or two here. As I have worked at the papa johns in this shopping center for several years, I can tell you it's going to be hard to lease that space anytime soon. The pig closed because they weren't allowed to put an entrance on lake murray blvd. Their lease was far from being over and they were still on the hook for the payments. They were suppose to try to sublease the space to some other business, but the pig was making it difficult because they really didn't want the shopping center to survive after the dispute about the entrance. For years the pig didn't move the rest of their stuff out of the place and that really turned potential tenants away from renting the space. The pig finally just stopped paying the lease on the empty space and that's when they finally moved the rest of their property off the premises. The pig still owes money on that lease and the owner tried to make it, but sadly he filed for bankruptcy and now the property is being managed by a firm appointed by the bankruptcy court. The new management just came by the other day to meet with all the remaining tenants and give them a heads up about what is going on and who to contact if there are any issues. The beauty school that's supposed to open there has to wait to open because of all the chaos going on. They should be able to open soon though. Hopefully this firm can lure some potential tenants, but we will have to wait and see. Thanks for the scoop, Tiffany. Good info. I went by the Kmart on at Seven Oaks tonight. There is not much of anything left. Jewelry is 80% off and most other stuff is like 40-60 off. The sign says 9 days left. I am guessing they may have an auction after the store closes to get rid of the shelving and fixtures that are left. I am not sure who would really want the old shelving because it looks so old and of it is beat up. What did they say when they updated you on what they were doing to try and fill the space? The whole entrance/exit to this center has been debated here several times by myself and others. I tend to agree that the access is hampered by only one way in and out and the present access is less than acceptable in most cases. As I have stated before, when I go to New China, Groucho's, or Papa John's, I often catch hell trying to turn left on Columbiana Dr. to get back to Lake Murray Blvd. But I do not really see a way to resolve this issue. If you look at the maps for this area you will see that the off-ramp extension from I-26 as well as the right turn-off to Columbiana Dr. pass right in front of High Pointe. There is no way that another entrance can be put in this area. I'm sure that the new hotel being built will have to find a meandering way to bring an entrance/exit back to College St. to come out on Lake Murray at the CVS pharmacy. I wonder what kind of bottleneck this may become. Which brings another thought to mind while I am rambling on. Irmo is building the new town park on Eastview Dr (off of College St.). This is going to be another nightmare of access unless it is handled properly. Eastview is a two lane residential road that accesses one small subdivision (Fox Glenn or Run or something like that) and then turns into a one lane dirt road that winds its way past several houses back to Lake Murray Blvd. right down from Zaxby's. As the street front along Lake Murray has become as crowded as it is I have no idea how the town of Irmo is going to deal with the new influx of traffic for the new park. 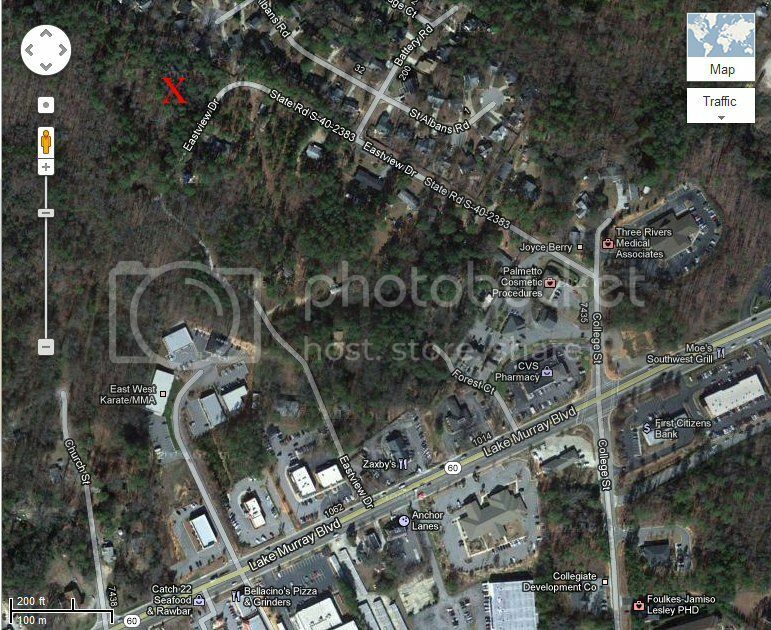 The town of Irmo has purchased 14 acres of land on Eastview Drive. 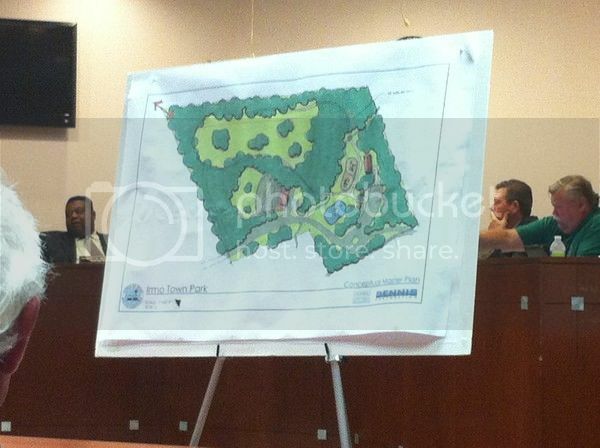 The plans are for the park to have walking trails, a playground, amphitheater, a pond and picnic areas. Click here to see what the layout of the park will be. Note that there's nothing on this layout that relates to parking area(s). Click here to see the land they are in the process of clearing for the park. "X" marks the spot. For the life of me, I can not picture the Okra Strut being held here. It's envision a nightmare. Now that I look at the picture of the park layout I think the grey area may be parking. If so, it's still going to be nowhere enough. Also that is not the nicest neighborhood in Irmo either. Noticed this week that a new real estate company has taken over this mall. Piggly Wiggly's are closing in a lot of places. I've heard of quite a few in Columbia, and I know that Florence had four stores when we moved there in 1993. Now there are only 2 pigs in Florence, one on Cherokee Rd, the other on David McLeod Blvd. This is a message to the webmaster. Your website is missing out on at least 300 visitors per day. I have found a company which offers to dramatically increase your traffic to your website: http://bit.ly/12NCUf9 They offer 1,000 free visitors during their free trial period and I managed to get over 30,000 visitors per month using their services, you could also get lot more targeted traffic than you have now. Hope this helps :) Take care. Please make this a fresh market or whole foods! This area is perfect location for one!!!! The State newspaper is reporting today that the mall owners will soon announce that a "specialty grocery" store will move into this site, though they won't say who. I will believe it when I see it. Amazing that this site has remained empty for this long. I know for a fact that Sprouts was the grocer that the state was referring to but they pulled out. Stars and Strikes is a gaming and entertainment franchise with locations throughout the South. The company combines mini-theme park attractions, arcade games, bowling, laser tag and a full-service restaurant. Birthday parties and events will be open for bookings, and there will be daily deals on bowling and games, too.